This Radio bundle contains 3 x TR-3020 temperature loggers, an Ultra Radio USB receiver, Tinytag Explorer Connect software, a USB cable and a mains adaptor. It contains everything you need to start logging. The TR-3020 monitors temperatures from -20 to +55°C using a built-in sensor. The logger's design makes it ideal for discreet indoor monitoring in a variety of buildings. It sends information via receiver to the computer managing the system. 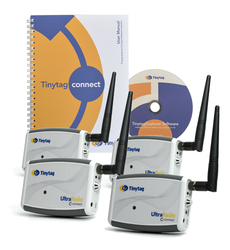 Radio data loggers operate using wireless connectivity and can be mixed and matched with Tinytag Plus LAN Ethernet data loggers within an application to meet particular site layout and infrastructure requirements.